I think you know by now I love my Crock-Pot. I use it all year round, but during the colder months, it’s part of my kitchen decor. What I love about the Crock-Pot is that meals are really easy to prepare and cook all day long, so you can do more important stuff and still enjoy a great and healthy meal. 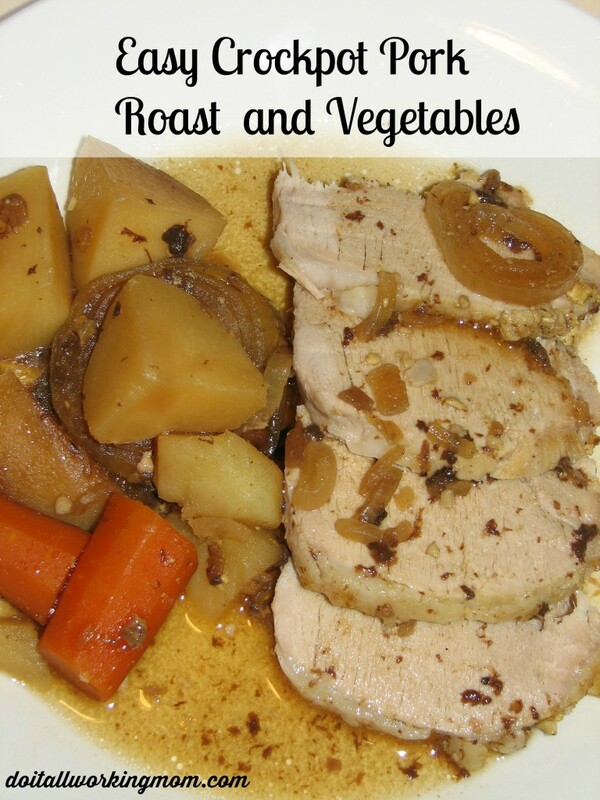 Today’s recipe is easy, simple and delicious: Easy Crock-Pot Pork Roast and Vegetables. 4 large carrots cut in big pieces. 5 medium potatoes quartered then cut in half. 1- Place the pork roast in the Crock-Pot. 2- Mix together apple cider, Dijon mustard and garlic. Spread on top and sides of pork roast. 3- Add your vegetables (onions, potatoes and carrots) around the roast. 4- Pour the beef consommé over the vegetables. 5- Add Salt and pepper to vegetables and roast. 6- Cook for 8 hours on low heat. Place the pork roast in the Crock-Pot. Mix together apple cider, Dijon mustard and garlic. Spread on top and sides of pork roast. Add your vegetables (onions, potatoes and carrots) around the roast. Pour the beef consommé over the vegetables. Add Salt and pepper to vegetables and roast. Looks yummy! I use the crockpot to make pork and turkey tenderloins. Always turn out tender and delicious! Yummy! We actually just had a crockpot pork just a few days ago, a winter staple in our house. I will add this to our list to try next week! Looks great! I love using the crockpot and am needing a new one. Thanks for the recommendation! It’s so good and easy to make. I love my slow cooker, too! Such an essential piece in my kitchen…I just got a 2nd one! Yummy! This is perfect for cold days like today!! Thank you so much for linking up with us today at the Bloggers Brags Pinterest Party. Your post has been pinned to our Bloggers Brags board. Thanks a lot for the amazing link-up!